"Once, there was a man who went crazy from too much reading. He only read books about knighthood; that was the problem." 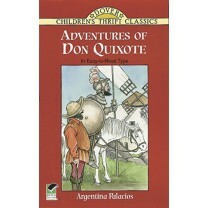 So begins this charming retelling of Don Quixote de la Mancha, one of the most entertaining books ever written. Young people will delight in the hilarious adventures of the idealistic would be knight and his squire" Sancho Panza", as they set out to right the wrongs of the world. Ms. Palacios, a talented storyteller, captures all the flavor and irony of the original as the two heroes ride forth to conquer evil. Along the way the well meaning but addled knight errant mistakes a miserable in and its keeper for a castle and its lord; imagines an ordianry peasant girl to be the noble lady Dulcinea, perceives windmills as giants to be overcome, and gets enmeshed in other cases of mistaken identity. These and many more incidents and adventures are retold here in a beguiling, easy to read version, enhanced by six new black and white illustrations by Thea Kliros. This edition is sure to delight today's youngsters, just as the original has enchanted countless readers since its publication nearly 400 years ago. A Dover Publication. Softcover. 60 pages.